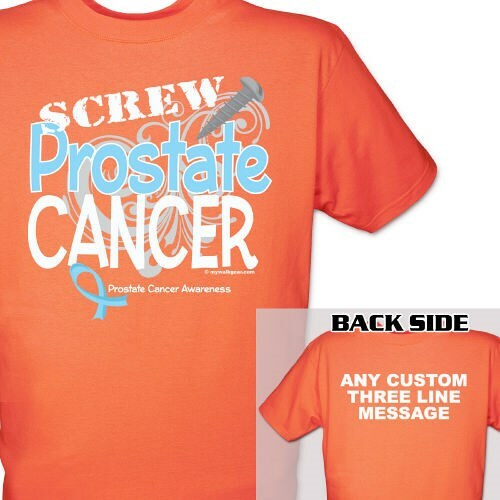 Our Personalized Screw Prostate Cancer T-Shirt is ideal for any prostate cancer survivor, warrior or advocates. Support those battling with this cancer, honor those taken and encourage all prostate cancer warriors and their families to never give up hope. Our Personalized Prostate Cancer Awareness T-Shirt is available on our premium cotton T-Shirt, machine washable in youth sizes XS-L and adult sizes S-3XL. Includes FREE Personalization! Personalized your Prostate Cancer Awareness T-Shirt with any three line custom message on the back. Easy order, good quality, fast delivery. Will def order again! Additional Info At MyWalkGear.com, we are proud to help make a difference for those diagnosed with prostate cancer so we have created a selection of unique Personalized Prostate Cancer Apparel and Walk Gear for you and your loved ones to helps spread awareness. You will also love to spread your awareness with our Prostate Cancer Awareness T-Shirt and our funny Screw Prostate Cancer Key Chain as well.